Sewing is fun and relaxing. But, sewing can be frustrating if you are unable to thread the needle. But don’t worry, this problem can be solved easily. Just spray some hairspray on the thread and it will get stiff and then you can easily guide it through the hole. Many of us don’t have a roller for this purpose. But you can use the stickiness of the hairspray to pick up the hairs, lint, and fluff on your clothes. Take a paper towel and spray some hairspray on it and then pick up the fluff on clothes using it. Too easy, isn’t it! This is one of the best hairspray hacks. If you have smeared lipstick on your clothes, then no need to worry. Just let the stain absorb hairspray for a few minutes by spraying some hairspray on the stain. Then wipe it off and wash it in the washing machine as usual. The hairspray will lift the lipstick off the garment. You can protect your chalk paintings from smudging by applying a coat of hairspray over it. Whenever we remove the attached sticker from anything, a sticky residue is always left behind which is difficult to remove. But you can easily remove this residue with the help of hairspray by just spraying some amount on it. Then wait for a few seconds and wipe off the residue. Ink stain on fabrics is a very common problem. But it can be solved by using alcohol-based hairspray. Spray some hairspray on the stain and then wash it after some time. 7. Tired Of Feet Slipping in Shoes? Frequently it happens, especially with heels that our feet slip when they are in that footwear. So to avoid this, spray some hairspray on your feet before wearing the footwear. It creates friction and prevents your feet from slipping. Keep your eyebrows in place by applying hairspray. Apply some hairspray on ear cleaning bud or mascara wand and then dress your eyebrows with the help of that bud. Don’t you get irked by continuous untying of shoelaces after you wear them? If so, then hairspray is the perfect solution. Just spray some hairspray on the laces after trying them and your problem is solved. Keep your curtains dust free and as shiny as new by spraying some hairspray on them. This prevents the dust particles from sticking to the curtain. 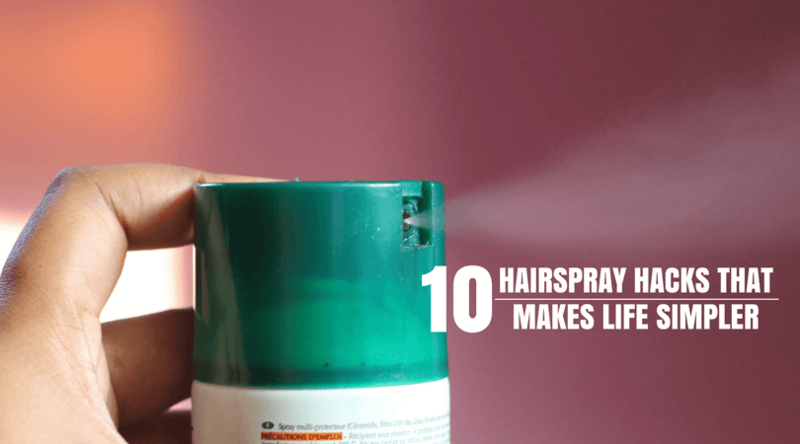 Now we hope this post is useful, but if you know some other hairspray hacks that we didn’t cover, email us or let us know in the comments below! We’d be glad to hear from you.